My friend Josh and I got here a little before closing - 9:30PM PT. I have no idea what the last part of the message means, but I liked the variety of flavors at Great American Yogurt. 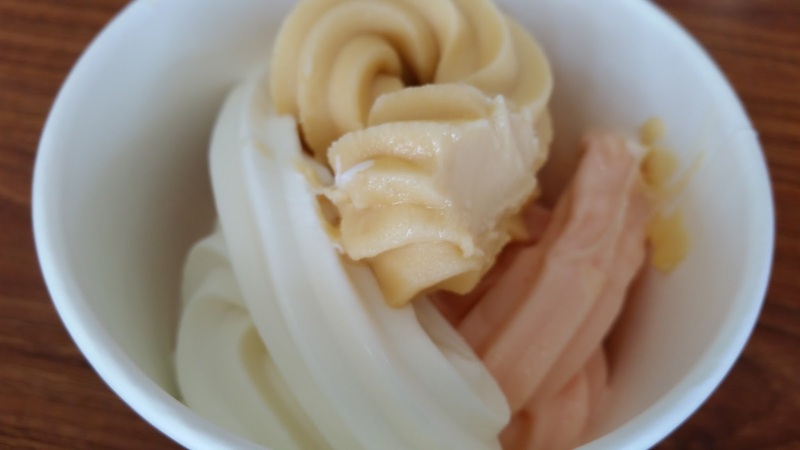 In particular, the consistency of the frozen yogurt is soft, much like Golden Spoon's. I like this softer frozen yogurt over harder, icy frozen yogurt. I do, however, love shaved ice. 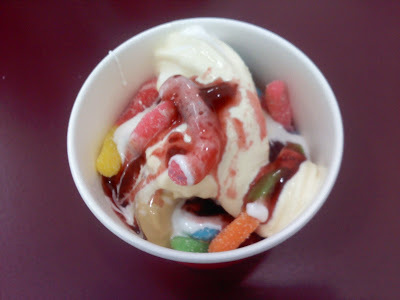 From the picture, I can tell I put some sour gummy worms and caramel on top. If the place had condensed milk, then there would definitely be condensed milk poured on top as well. Josh, Michael, Kevin, and I came here today for dessert after going to BJ's Restaurant and Brewhouse. 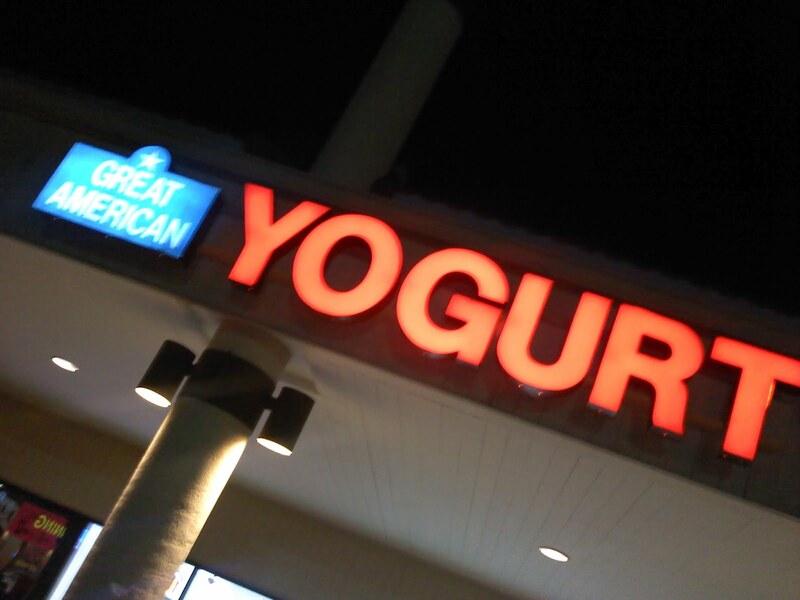 *The original note refers to "vanilla yogurt", and I'm just going to assume it meant vanilla-flavored frozen yogurt. 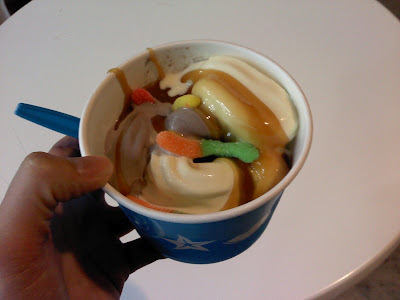 I would further add that the dulce de leche was quite sweet. In fact, it was almost too sweet for me, which is saying a lot, because I love sweet food. So Josh and I were planning to come here after getting breakfast at The Bread Crumb Ohana cafe, but there was a decent wait for The Bread Crumb and we up spontaneously decided to go to Great American Yogurt first. In contrast to 20120523 where we happened to arrive just before closing, today we happened to arrive soon after opening. In any case, I tried the nonfat peach flavor (delicious), the Chocolate Turtles flavor (okay), the Oreos flavor (better than the Chocolate Turtles), the custard (delicious, creamy; reminds me of the custard at Frostbite, except this one has an eggy taste; best flavor). Having my fill of samples, I got some peach, custard, and took my chance on the (pineapple) Dole Whip. From what I remember, it tasted harder than the Dole Whip at Disneyland. However, Josh said it wasn't this hard the last time he came.